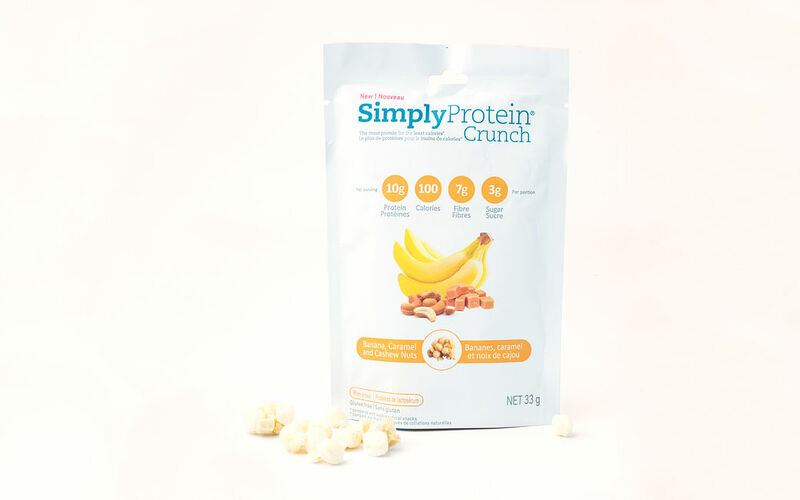 Snack in style with SimplyProtein™'s Banana, Caramel and Cashew Crunch, a blend of nourishing banana, exquisite caramel and nutty cashew. For only 100 calories, each pouch boasts a meager 3 grams of sugar and an amazing 10 grams of whey protein, making it perfect as a trail mix alternative. Whey protein puff spheres (whey blend (whey protein isolate, whey protein concentrate), rice flour, calcium carbonate, soy lecithin), chicory root fibre, banana, cashew nuts, natural flavour, sea salt.